“If inspections of Iranian military sites are ‘merely a dream,’ as Iran says, then Iranian compliance with the JCPOA is also a dream,” Ambassador Haley said. “If the IAEA were to seek access to Iranian military sites to verify Iran’s nuclear declaration, Iran must follow the unambiguous access provisions of its IAEA safeguards agreement, the Additional Protocol, and the JCPOA,” according to Haley’s statement. However, despite pressure from the U.S., UN nuclear inspectors do not feel it is necessary to inspect Iran’s military sites, according to Reuters. The UN’s nuclear watchdog released a report claiming Iran was in compliance with the deal despite the country’s refusal to allow inspection of their military sites. 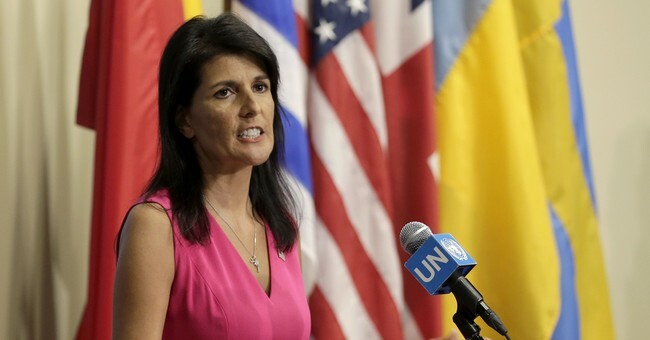 Haley also slammed the announcement by the terrorist group Hamas that it had restored relations with Iran and was receiving financial and military aid from Tehran. “Under UN Security Council Resolution 2231, Iran is prohibited from exporting any and all arms absent Security Council approval. That same UNSCR 2231 embraced the JCPOA, the nuclear deal with Iran,” Haley's statement points out.